In October 2009, Michael Nash contacted me about publishing his work on disassembling the TI-89 Titanium, comparing the two major hardware revisions, and use electroluminescent wire (EL wire) to add a backlight. At long last, I have gotten around to translating his PDFs and images into a news article and forum topic. Enjoy Michael's work! 1. Obtain a TI-89 Titanium graphing calculator. 2. 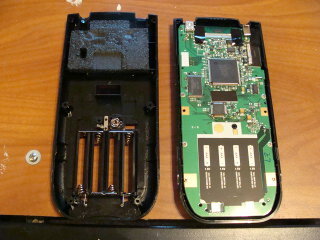 Flip it over and remove the batteries and the 6 torx screws. They are size T6. Just buy a T6 Torx screwdriver, trust me. 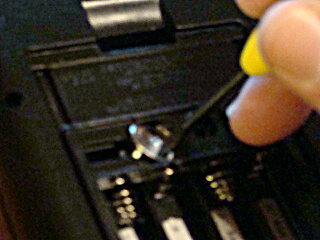 Remove the backup battery cover by removing the small phillips screw, and then remove the small disc battery in a method similar to the method I used below. Now it is time to separate the case. 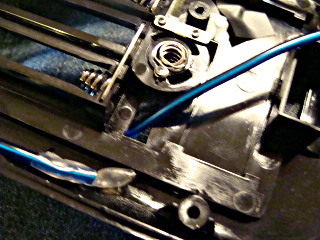 I use a flathead to wedge a piece apart, then slowly slide another flathead up to pop the plastic clip off. 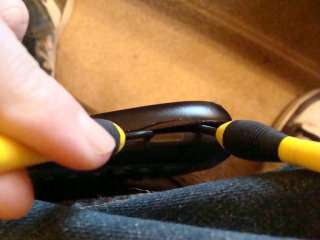 It takes some fidgeting, and the first time it goes *pop* it's going to scare the hell out of you, but just keep going. Once you pop a clip from the left side, move to the right side (or vice versa if you started on the right side.) The bottom left corner is my lucky starting point. 3. Take a moment to marvel at the beauty of the inside. Go ahead and marvel while I include a super bonus section for those out there who are interested in the difference between HW1 and HW2 TI-89 Titaniums. 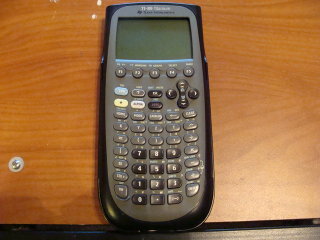 The first picture below is of an HW2 TI-89 Titanium. I decided while I had this one cracked open to pull out my older HW1 TI-89 Titanium and snap some pictures side by side for those who would be interested in it. There aren't any pictures of this kind of stuff on the net, so I felt it was my responsibility to document it. 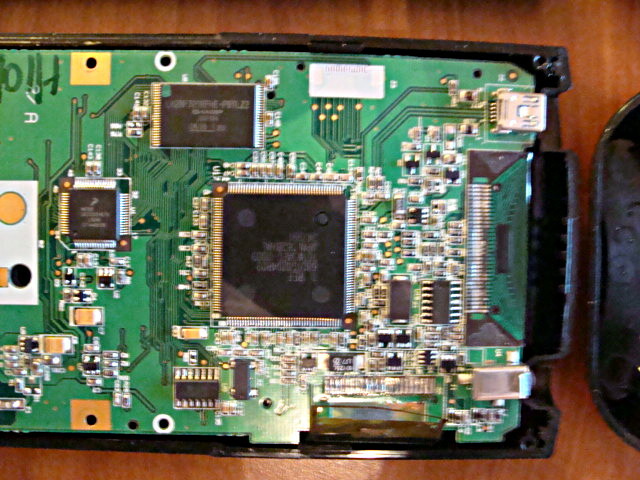 The second photo shows the foil shield over the HW1 motherboard, and the HW2 motherboard with the shield removed. 4. 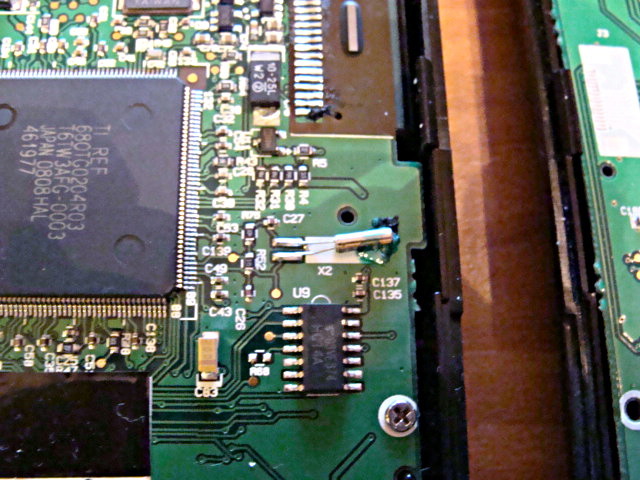 Here is a (poorly-focused) closeup of the HW1 calculator's motherboard. 5. 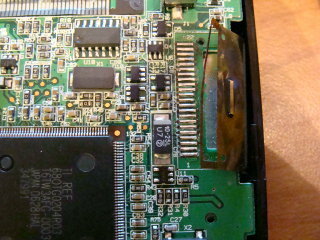 Here is one of the differences between the two, a crystal oscillator in the HW2 TI-89 that the HW1 device lacks. 6. 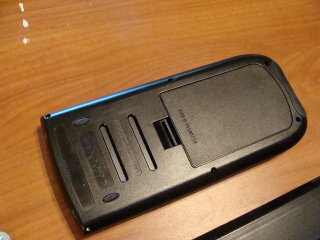 This is the TI-made CPU for the calculator. 7. 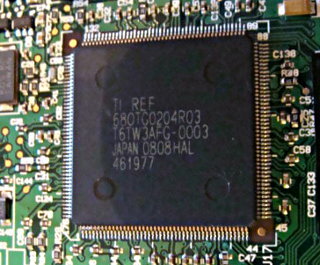 This is the Flash chip from the HW1 TI-89, which sadly ended up with a ripped LCD ribbon cable (if it makes you feel any better, it wasn't ripped in the course of this tutorial). 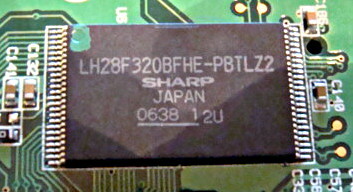 The big SMD component directly below the ribbon cable, labelled 10-25L, says "U7" on the HW1 motherboard but "W2" on the HW2 motherboard. 8. Anyway, moving on from the hardware eye candy. 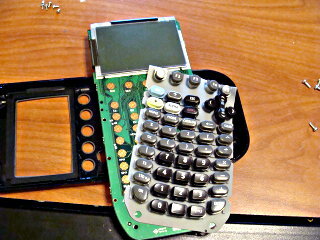 Take the motherboard out of the front cover of the calculator after removing the small screws along the edges holding it in place. Take the keyboard off, trying to keep the keys in place if possible. 9. Take a look at your EL wire, and make sure that it works. Oooooooh. 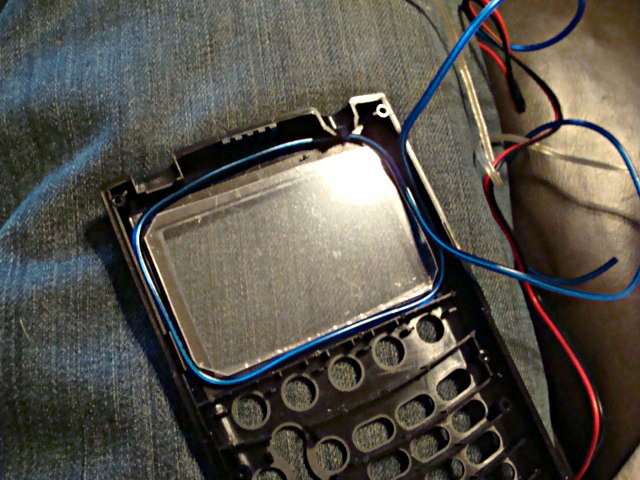 Wrap the EL wire in a circle around the screen aperture in the front of the plastic calculator case. When you put the motherboard back on, make sure that the two ends of the EL wire protrude to the top and bottom of the side LCD ribbon cable, to avoid stressing the cable. 10. If you choose, you can spread the light better with a bit of plexiglass. I took a piece of thin plexiglass I got from Hobby Lobby and cut a screen to hold the EL wire in place and to allow transport of light. It was too shiny, so I put a thin piece of anti-glare film on it and made it better. 11. 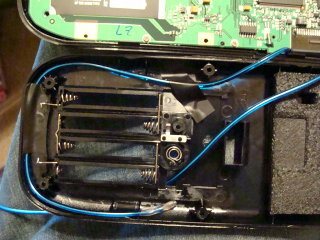 Loop EL wire through here and poke it out the hole next to the disc battery. 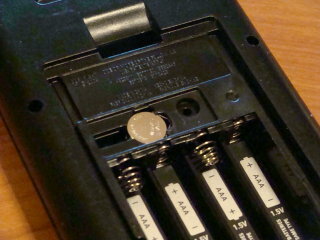 The end poking out eventually goes to the inverter and then battery pack. The other end just sits inside the case. And that's it; from here you need to use your imagination. 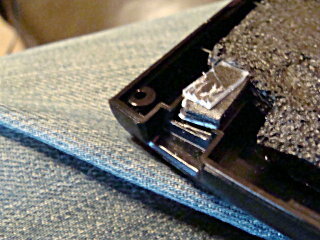 I didn't do anything to connect the battery to the case, I just went through this to put on the Internet to give someone somewhere a ray of hope, because by god I've spent the last few nights scouring the interweb, and I am sick and tired of the RichFiles and his @#$%^ LEDs from 1996. An electroluminescent strip behind the LCD screen would be ideal, but then you risk your TI-89 meeting the same demise that the HW1 ti89 did that you saw above. After this install, I disassembled and took it all out. Notice i did not make ANY cuts to the case, or any gluing. 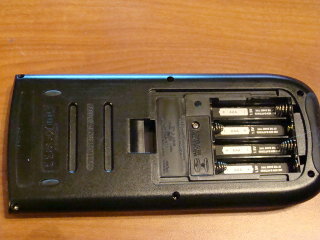 Nothing was done to this TI-89 that couldn';t be undone. I could not get it to be very bright, but I was pretty limited on resources. 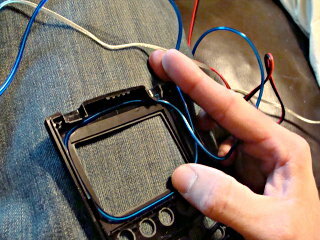 I got the EL wire from AutoZone, so it's cheap, made to go on some stupid modded car's dashboard. 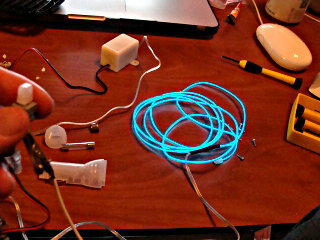 There is much brighter EL wire out there (check coolight.com) that would most likely work much much better. Try getting some stuff at all the sizes to see what will work best, and get WHITE. the blue put too much color on the screen and blended with the dark of the LCD. Also, find some antiglare film. You don't need the plexiglass + antiglare film, but it doesn't hurt. In theory, it should increase the amount of light that reaches the surface of the screen. In practice, it takes some time cutting. That time could be spent [otherwise employed]. Depends on where your priorities are. Editor's notes: The images and text have been trimmed and re-organized to fit this format. The language in the tutorial has been cleaned up slightly, as has the grammar and punctuation, but I have done my best to try to preserve the author's original tone and content. This information was created and is copyrighted by Michael Nash, and has been posted and reformatted here with express written permission. Enjoy this long-suffering piece of research missing from community documentation, and please try it out, with the usual caveats that you breaking your calculator is nobody's fault but your own, and that we disclaim all liability for injury to gadgetry, you, or anyone else from following this tutorial. Perhaps try it with a TI-83+, with its huge empty spaces in the case, or a TI-84+, which has a very similar internal layout to the TI-89 Titanium! This is wonderful tutorial, thanks for sharing with us, and thanks to Michael Nash for subjecting his calculators to science. My pleasure! 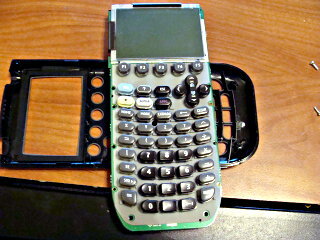 And one of the two calculators, as you noted, paid the ultimate price, although not for this particular tutorial. I'm ashamed that it took me this long to get around to actually posting it, and I am now one (very recent) email from having zero emails in my inbox. Wait... I thought the HW revisions for the TI-89 Titanium were 3 and 4, not 1 and 2? Yes, but not being experienced in the intricacies of the TI-89 non-Titanium, I believe Michael chose to call the first and second revisions of the Titanium hardware 1 and 2. I wonder if fx-9860's and fx-9750's could be modded in a similar fashion? 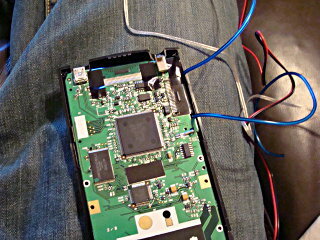 It depends how the LCD is constructed. I did LED edge-lighting of plexiglass about a decade ago to backlight several of my TI-83+ calculators, and found that it gave decidedly mixed results. Does anyone have a spare fx-9860g that they could try it with? 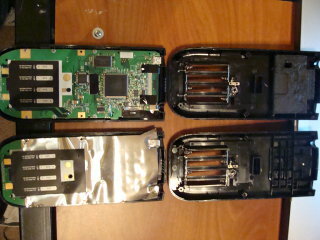 Well, I have a 9750, but i am not too fond of the idea of taking it apart when no one else has yet. There's no room behind the screen, except for perhaps some tiny SMD LEDs. The most frequently-used lighting method is edge lighting, wherein lights are shined sideways into the screen or plexiglass behind/above the screen. That's what I have tried, and that's essentially what this is too. Even better would be an EL sheet behind the screen, as Michael notes. I know I've seen one TI-89 implementation of that. The two versions of the Titanium are HW3 and HW4. This is what we call them, and this is what TI calls them. I answered that issue in my post from August 10th. Tom: Yes, that would bea good idea for a more permanent version of this. © Copyright 2000-2019 Cemetech & Christopher Mitchell :: Page Execution Time: 0.174211 seconds.